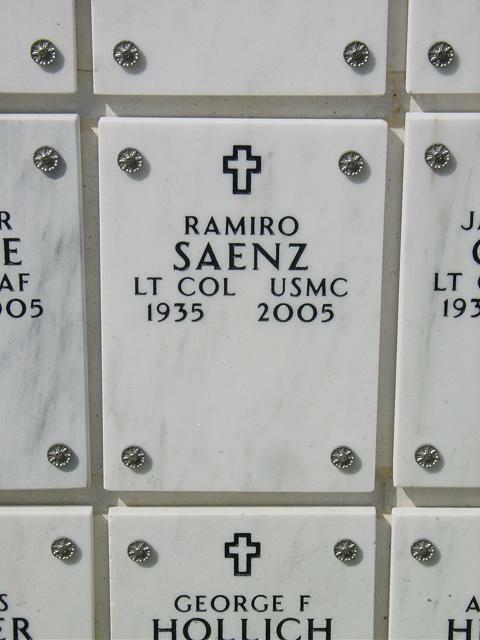 Ramiro "Rami" Saenz, 69, a retired Marine Lieutenant Colonel and a former senior communications engineer at ANSER in Arlington, died March 17, 2005, of brain cancer at his home in McLean, Virginia. Colonel Saenz was born in Yorktown, Texas. He grew up the son of migrant workers in the small Rio Grande Valley town of Pharr, where, from age 11 until he went off to college, he was a newspaper carrier for the McAllen Monitor. His parents left migrant work and bought a small grocery store in Pharr because they wanted their six children to get an education. In later years, Colonel Saenz's own children got used to fielding his math questions at the dinner table, just as his father had quizzed him, and his family said he was grateful his whole life for a fifth-grade teacher who told him he had great academic potential. A math whiz from an early age, he won a scholarship to Rice University in Houston, but his family could not afford to send him. He also won a scholarship to the University of Texas at Austin and attended for a year but could not afford room and board. In 1955, any concerns about room, board and tuition expenses evaporated when Rep. Lloyd M. Bentsen Jr. (D-Texas) sponsored his appointment to the U.S. Naval Academy. He received his undergraduate degree in electrical engineering in 1959. Ten years later, he attended the Naval Postgraduate School in Monterey, California, where he received a master's degree in communications management in 1971. Colonel Saenz became a U.S. Marine in 1959. Working in communications intelligence and communications technology, he served two tours in Vietnam as well as at Quantico Marine Base. He was also based in California, Hawaii, North Carolina, Virginia Beach and at Marine Corps Headquarters in Arlington. He was the Marine Corps representative on the planning and design team for TRI-TAC, a joint tactical communications system. The TRI-TAC project, which involved all four military services, developed telephone switching equipment for field use. It is used widely in combat and in training. He received the Bronze Star with Combat V and other awards for service in Vietnam. He retired as a Lieutenant Colonel in 1979. From 1979 to 1984, he was a communications systems analyst for the McLean-based Mitre Corp., and from 1984 to 1986, he held the same position at Computer Sciences Corp. in Falls Church. He was a senior communications engineer with ANSER, a research institute in Arlington, from 1986 to 1995, when he retired a second time. He loved speed and, over a period of years, owned six high-performance sports cars. After one too many speeding tickets, his wife insisted that he sell his beloved red Ferrari. He was a member of Trinity United Methodist Church in McLean and a volunteer with TEDI -- Telecommunications Exchange for the Deaf -- in Great Falls. In retirement, Col. Saenz traveled across seven continents, including, most recently, to South America, where he visited Patagonia, Chile and Argentina. He visited Antarctica on the same trip. An avid swimmer and boater, he began each day of his retirement years by swimming at least 40 laps at a health club pool. He also enjoyed boating and fishing on Albemarle Sound. Survivors include his wife of 46 years, Raquel Saenz of McLean; two children, Dianne Saenz of Alexandria and David Saenz of Sterling; two sisters; three brothers; and two granddaughters.